I love the simplicity of slow cooker meals and I am always looking to revamp some traditional Vietnamese dishes using an appliance most of us have. Using a slower cooker is so effortless and if you’re busy like me, every bit of time-savings is a blessing. 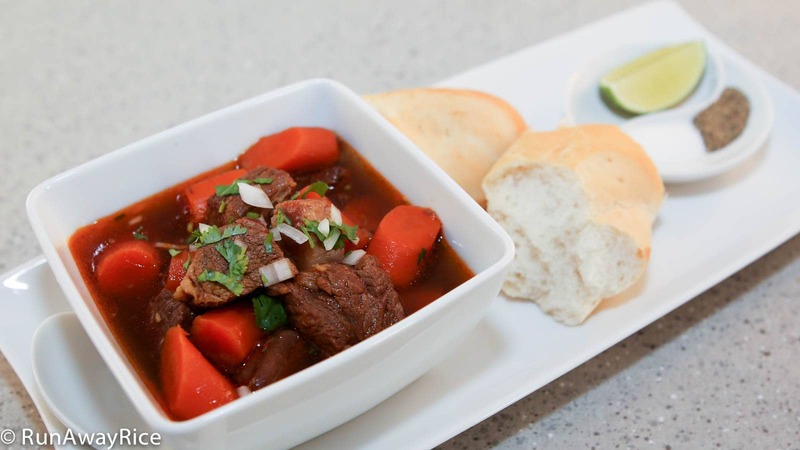 With this easy Slow Cooker Beef Stew (Bo Kho) recipe, you can prep everything (including searing the meat) the night before and then store in the fridge. In the morning, add everything into the slow cooker, set the temperature to Low and let it cook throughout the day. Upon coming home, slice some bread or cook some noodles, make the onion/cilantro garnish and you have a hot and delicious dinner ready to enjoy! The beef tendon is an optional ingredient. 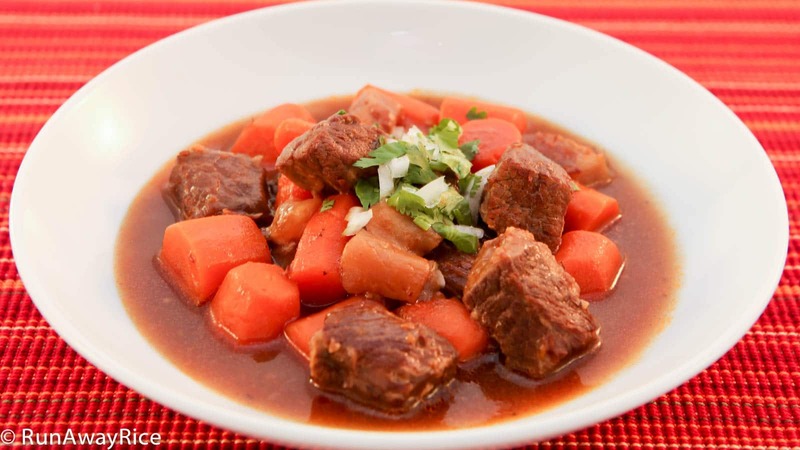 If you enjoy beef tendon, it’s wonderful in this stew and adds delicious texture and crunch. If you’re not familiar with how to prepare and cook beef tendon, please watch the video for some helpful tips. Searing the meat is an important step when preparing beef for stews. The process enhances the flavor and color of the meat. (If you’ve ever made a stew without searing the meat, you may have noticed the meat is gray and dingy looking.) Be sure to use a large wok or skillet so the beef has lots of contact with the hot surface. 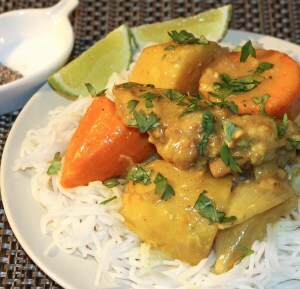 This Vietnamese stew does not have potatoes but if you like potatoes, reduce the carrots to 1/2 lb and add 1/2 lb potatoes. Adjust the water levels depending on how you want to eat this stew. If serving as a noodle soup, you’ll want more liquid, so add an extra cup of water. For a thicker stew, cut the water back by 1 cup or thicken using cornstarch. Combine 2 Tbsp cornstarch with 3 Tbsp cold water. Stir to dissolve. Add to the stew and mix well. Turn-up the temperature to High and cook for 10-15 minutes. One of the best things about using a slow cooker is the timing does not have to be exact. If cooking on Low, cook the stew for 7-8 hours, on High temperature 3-4 hours. Don’t forget to remove the lemongrass, star anise, bay leaves before eating. If you don’t have a slow cooker, you can cook this over the stove. Add the seared meat, lemongrass, star anise, coconut water and water into a large pot. Cover and bring to a boil. Reduce the heat to Low and simmer for 45 minutes or until the meat is tender. Add the carrots and continue cooking until soft, approximately 20-25 minutes. Sprinkle salt and vinegar on the beef tendon and rub it into the tendon for about a minute. Rinse with cool water to wash off the salt and vinegar. Add the tendon into a large pot of water. Cover and bring to a rapid boil. Reduce the heat and simmer for 2 hours. Rinse the cooked tendon with cool water. Refrigerate for 2 hours. Cut the tendon into 1-inch cubes. Cut the beef chuck roast into 1 1/2-inch cubes. Combine the chuck roast and cooked beef tendon with salt, curry powder, soy sauce, Vodka 5-Spice Marinade, and Hoisin sauce. Cover and allow to marinate while continuing with the next steps. Cut off a 6-inch section of lemongrass. Peel off the tough outer skin and discard. Cut the lemongrass in half. Using a wooden pestle or meat hammer, smash the ends of the lemongrass to release the aroma. Peel and clean the carrots and then cut into 1-inch sections. Heat a large wok over Medium High heat and when hot add the vegetable oil. Add 1/4 cup of the finely diced onions and the minced garlic. Stir-fry for 15-20 seconds. Add the tomato paste and stir-fry for 30 seconds. Increase the heat to High and add the marinated beef. Stir-fry for 5 minutes searing the meat on all sides. Add the carrots into the slow cooker and arrange in a single layer. Add the lemongrass, 1 star anise and 2 bay leaves on top of the carrots. Add the seared beef. Place the remaining spices on top of the meat. Add the coconut water and water. Cover and set the slow cooker to a Low temperature setting. Allow to cook for 7-8 hours. Chop the fresh cilantro and combine with the remaining diced onions (prepared earlier). Garnish the Beef Stew with this fresh medley just before serving. 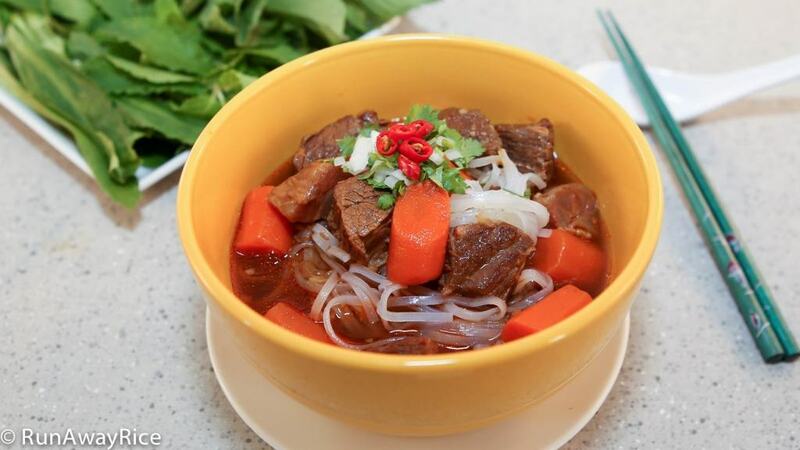 Serve this delicious Beef Stew with crusty French bread or over tapioca noodles (hu tieu) for an amazing and hearty meal! Store any remaining portions in the refrigerator and enjoy within 3-4 days. I just made this last night and it was delicious! Even my Vietnamese parents were impressed! 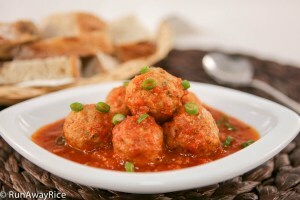 Thanks for sharing all your great recipes! Thanks for posting this.. going to try it.. We always get the beef stew at our local Vietnamese restaurants. the one place uses daikon radish so will add that to this recipe. Daikon radish is a yummy addition! Enjoy the recipe! Hi Trang, can I substitute coconut water with chicken broth? Can I use pot roast beef instead of chuck roast and tendon, does it take less time to cook? I am trying to cook with what I have in the freezer. I love all your recipes. Thank you. You can use chicken broth instead of coconut water. A cut for roast beef would work great. This recipe is really forgiving so definitely use what’s in the freezer. No adjustments to the cooking time is needed. Good luck and let me know how it turns out for you! When do you add the already prepped tendon? I do not see that in your video nor instructions. The beef tendon is combined with the beef and then marinated. Hey Trang, can this be done from Instant Pot pressure cooking? I have not tried making this dish using the Instant Pot pressure cooking but I think it would really work out well. I would pressure cook the tendon separately first. Use the sauté feature to sear the meat and then pressure cook on High for 30 minutes. Good Luck! can you use coconut soda instead of coconut water? Yes, coconut soda works too. Enjoy the recipe! 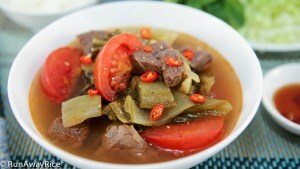 Love your slow cooker Vietnamese recipes! As I have a very busy schedule and miss my mom’s home cooked meals, these recipes make it possible to cook these meals while saving time. Thanks!